The extraordinary public clash over Trump's most consequential policy decision to date laid bare the discord and dissent surrounding the executive order, which temporarily halted the entire U.S. refugee program and banned all entries from seven Muslim-majority nations for 90 days. 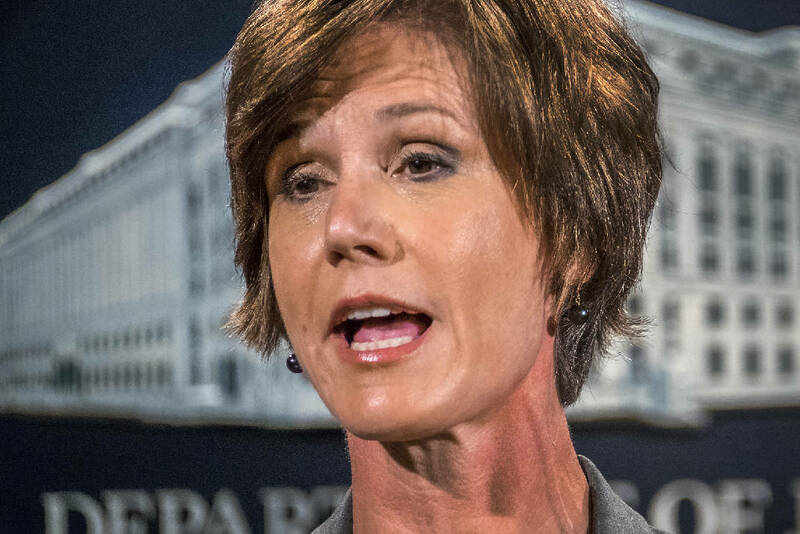 The firing came hours after Yates directed Justice Department attorneys not to defend the executive order, saying she was not convinced it was lawful or consistent with the agency's "obligation to always seek justice and stand for what is right." In a statement, Trump said Yates had "betrayed the Department of Justice by refusing to enforce a legal order designed to protect the citizens of the United States." He named longtime federal prosecutor Dana Boente as Yates' replacement. Yates' abrupt decision reflected the dissent over the order, with administration officials moving to distance themselves from the policy. As protests erupted at airports over the weekend and confusion disrupted travel around the globe, some of Trump's top advisers and fellow Republicans privately noted they were not consulted about the policy. Other parts of Trump's administration were voicing dissent Monday. A large group of American diplomats circulated a memo voicing their opposition to the order, which temporarily halted the entire U.S. refugee program and banned all entries from seven Muslim-majority nations for 90 days. In a startlingly combative response, White House spokesman Sean Spicer challenged those opposed to the measure to resign. The blowback underscored Trump's tenuous relationship with his own national security advisers, many of whom he met for the first time during the transition, as well as with the government bureaucracy he now leads. While Trump outlined his plan for temporarily halting entry to the U.S. from countries with terror ties during the campaign, the confusing way in which it finally was crafted stunned some who have joined his team. Mattis, who stood next to Trump during Friday's signing ceremony, is said to be particularly incensed. A senior U.S. official said Mattis, along with Joint Chiefs Chairman Joseph Dunford, was aware of the general concept of Trump's order but not the details. Tillerson has told the president's political advisers that he was baffled over not being consulted on the substance of the order. U.S. officials and others with knowledge of the Cabinet's thinking insisted on anonymity in order to disclose the officials' private views. Trump's order pauses America's entire refugee program for four months and indefinitely bans all those from war-ravaged Syria. Federal judges in New York and several other states issued orders that temporarily block the government from deporting people with valid visas who arrived after Trump's travel ban took effect. The president has privately acknowledged flaws in the rollout, according to a person with knowledge of his thinking. But he's also blamed the media — his frequent target — for what he believes are reports exaggerating the dissent and the number of people actually affected. Trump has also said he believes the voters who carried him to victory support the plan as a necessary step to safeguard the nation. And he's dismissed objectors as attention-seeking rabble-rousers and grandstanding politicians. Policies with such broad reach are typically vetted by affected agencies and subject to review by multiple agencies. It's a process that can be frustratingly slow but is aimed at avoiding unintended consequences. On Capitol Hill, lawmakers in Trump's party sought to distance themselves from the wide-ranging order. "Nothing he did over the weekend was new," said Newt Gingrich, the former House speaker and an informal adviser. He conceded that coordination could have been better, but he said Trump's vow to quickly bring change to Washington will sometimes mean he needs to prioritize fast action over broad consultation. "If you're the reformer, you need the momentum," Gingrich said.